In our culture's current divisive, us-versus-them world that's riveted to others' differences, I invite Houston area men to consider talking about life with others in a safe and trustworthy community that recognizes each man is worthy of being heard and retains the responsibility to freely direct his own life. "A Walking Tour of Male Spirituality," based on the book So Dad, What Makes a Man? : A Narrative on the Male Identity, begins at the Cenacle Retreat House, 420 N. Kirkwood on January 23 for ten consecutive Thursday nights until March 27. Joining me to facilitate are Lloyd Guerin, a spiritual director at the Cenacle and leader of men's retreats for over ten years, and Luis Canales, a founding member of the retreats known as Adoration, Community, Theology, Service (ACTS). A book copy is included in the $125 minimum offering. You can register online at www.cenacleretreathouse.org or, call the Cenacle with any questions or help at 281-497-3131. As men, we want to get better at building something greater than ourselves through our personal relationships with other men and, importantly, with God. Our tools will include practicing listening skills and various spiritual exercises. Here men can demonstrate we need not be alone bearing pain when life becomes difficult. We recognize this is contrary to the prevailing culture that men are not to acknowledge their human weaknesses. One Man's Opinion of So Dad, What Makes a Man? Although men's lives vary greatly one from another in detail and circumstances, I believe our human, male psyche underlies how we proceed as individuals and the obstacles we face. Tom Peery's real life experiences demonstrate we proceed along an uneven path--this is how life works! 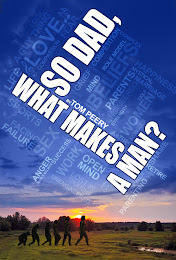 Yet what underlies Tom's journey is the "big picture" of human, male development. Too often works on male spirituality tend to give the impression of a single path, whereas when we consider a life story such as Tom's we see a much more complex mix of movement--sometimes making it hard to see the overarching pattern. Yet given the full path of our lives we see a distinct trajectory that has great commonality. I truly loved reading So Dad, What Makes a Man? I would never have imagined a book where one bares his emotions and spiritual soul would be a page turner like a great novel. I couldn't wait to see what each subsequent page would reveal. I invite you to try this with someone you know: Give them a quarter, a dime and a nickel. Ask them to compare the coins, then listen to whether they first say how the coins are different, or, alike, or, some combination of both. There is no correct answer, only evidence that as individuals we make different initial judgments about the same information. I once thrived on people's differences by rejecting people who believed differently than me--sometimes on a single issue. An old Webster's College Dictionary defines unreasonable feelings, emotions, and opinions of a hostile nature regarding national, racial or religious groups as "prejudice." These days prejudice seems quite fashionable. It certainly was for me when I was young. The trendy refusal to ignore other people's similarities is like not noticing that those coins in the above comparison are all money, all round and made of metal, and all marked with "The United States of America," "E PLURIBUS UNUM," "Liberty" and "In God We Trust." In the introduction to So Dad, What Makes a Man? I say some of the country's male political leaders disappoint me, right before admitting I spent my first half of life following the footsteps of my father, who was very comfortable with polarization. He and I were convinced of the rightness of our opinions. Differences were important then because they manifested competition--by differentiating my college classmates by grade point, my military enemies by uniform, my corporate status and my company's products by performance. In all of those, from college beginning in 1962 through my corporate life ending in 1991, my only competitors were men. To be successful among men, my father taught me to be competitive, aggressive, logical, cool-headed and ambitious. . . pretty much the opposite of how he viewed women: emotional, accepting, care-givers, submissive, and nurturing. Yet when my midlife crisis arrived, what I most desired was to know who I was, and, to have better relationships and a spiritual life. I have worked on that since by exploring the qualities within me that Dad had assigned only to women. My accomplishments differentiate me from men, while sharing a common emotion unites us. For example, revealing our grief following the senseless murders in Newtown, Connecticut. The more I explore my inner life the more its complexity fascinates me--from learning my preference of similarities in initial comparisons from the coin game, to finding that others don't cause my anger and I don't cause theirs. My mind is the most intriguing, where thought processes take place among billions of neurons that have trillions of connections. My father used to warn me not to listen to other people's opinions because they would "mess with my mind." Dr. Lee Roy Beach in The Psychology of Narrative Thought: How the Stories We Tell Ourselves Shape Our Lives, (2010) says as a social creature, I listen to those around me, and from what I hear, whether a political ad or my best friend, I constantly revise how the world works, what has happened, and what might happen. Either I accept what I hear unquestioningly, or reject it, or accept it provisionally or in part. My reality is my truth. That is how I make sense of things. So my challenge to relate better to God and others and to know myself, is to better understand my memories, perceptions, imagination and decision making. Decisions that I make involve my feelings and emotions and are value judgments, i.e., choices that reveal more about my values, fears and memories than about the reality of what is. My spiritual growth also depends on awareness and knowledge of my emotions. Without these, I cannot practice, for example, St. Ignatius's Examen, that he considered the bedrock of Jesuit men's growth. Some women I know who are crossing over from their "traditional" characteristics give me courage to do likewise, by exploring characteristics within me my father found feminine.